Even after repeated dates offered by the government officials and the steel and mines minister of Orissa, the renewal of Memoranda of Understanding (MoU) between the Orissa Government and the Korean Steel major POSCO couldn’t materialise. The MoU signed on June 22, 2005 which had a five years’ validity term expired since June 21, 2010. The high handed approach of the Indian government of Orissa and its agencies to pursue the India project of POSCO on the ground even without a valid MoU raised many questions from different quarters. When the former law minister and now a Congress Leader and member in the National Law Board Narasimha Mishra has repeatedly raised the issue and questioned the land acquisition by the government, senior BJD leaders like Dr Damodar Rout and a few others have always insisted that the government must go for immediate renewal of the MoU. While the political and public debates over legitimacy of land acquisition by government agencies and the local administration for a company without any valid MoU placed the government of Orissa more at fault, this also built pressure on POSCO and the Orissa government both for an early renewal of the MoU. But, none could go for just a renewal of the old MOU as the clauses like iron ore swapping and a captive port in the erosion zone of the coast have drawn wide reaction in both political and intellectual circles across the country. When the steel and mines minister had confirmed a month back about submission of the draft of the revised MoU with POSCO for consideration, the abolition of swapping clause seems to have become the major bottleneck in convincing POSCO to sign over it. 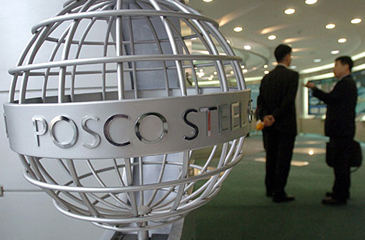 Some also believe that POSCO is not quite comfortable with the 60 conditions, 28 for the steel plant and 32 for the minor captive port, put in the final environmental clearance that would, possibly, cause problems even after the plant and port go operational. However, POSCO authorities are tight-lipped to explain the reasons of delay in renewal of the MoU. On the other hand, Orissa government authorities are not interested to give any possible time frame fearing that the other party POSCO may not turn up to respect the time frame set by Orissa government. Orissa’s Steel Minister Raghunath Mohanty avoided giving any further date saying that, "You will know when the MoU is going to be signed. After two failed dates, I can’t give any date now. We have sent the draft MoU for consultation of POSCO and are still waiting for response”. Earlier, both the Steel Minister and Chief Secretary of Orissa told the media that the renewal of MoU between the government and POSCO would be materialised by the end of July 2011. In the earlier MoU signed in June 2005, there was a clause (19 v) in the general category that stated, “The MoU shall remain valid for a period of five years from the date of signing. Further extension, if necessary, shall be made as per mutual agreement. However, no such extension shall be considered unless the Company has made substantial progress on implementation of the project in terms of construction, erection of plant and machinery and investment at site to the satisfaction of the State Government in these five years in implementing the first phase as envisaged in this MoU”. Till the MoU completed five years, the project absolutely made no progress. Not even a single brick was placed as part of POSCO project work except a site office running in a rented house in the Kujang market. As per the MoU, Orissa government has all grounds to cancel the project and say good bye to POSCO. It’s still a mystery to crack how the government of Orissa could satisfy it with the amount of progress made by POSCO in setting its integrated steel plant and why it is too much persuasive about the project. And, the primary question is why the Orissa government is not, rather, issuing a show cause notice asking why the POSCO would not be shown a good bye signal. As the state has enough ground to do this, it would be nothing unlawful or against the norms and the spirit of the MoU that was signed earlier. But, instead of following the laws of the land and, also, the terms mutually agreed in the earlier MoU, the government and its agencies have been openly violating the both for no other reason but to make POSCO come in. Even without a valid MoU, the government is acquiring land for POSCO, cutting down lakhs of cashew and Casuarina trees in the coastal forests near Paradeep to make the ground ready for POSCO. When asked that how relevant it is in the absence of a valid MoU with the company these are all meant for, Orissa’s Chief Secretary Bijay Kumar Patnaik says that “all the works are being pursued as per law and permission granted by concerned ministry of the union government” adding that, “we are still in consultation with POSCO for the renewal of the MoU. The consultation usually takes some time and we hope the MoU will be renewed at the earliest”. However the administration also keeps its lips tight to give any specific time frame this time. The irony with POSCO’s Orissa project is that, when the Orissa Government is worried for no response to its draft MoU from the company and when the Korean company is at a losing position as per the terms and conditions of the earlier MoU and doesn’t posses a valid MoU with the government so far, the Korean president Lee Myung-Bak is putting pressure on the federal government of India and thus the provincial government of Orissa by openly lobbying for POSCO’s India project at diplomatic level. It’s fine to lobby for a company that desires to invest outside and make huge revenue for the country, but should it be at the cost of the laws of another country and the basic rights of the people who are forced to be the losers? And, the South Korean President mustn’t ignore to the fact that the company he is lobbying for is facing many cases in the Orissa High Court and the Supreme Court of India. “The South Korean president Lee Myung-bak has no qualms batting openly for Posco and asking our Rashtrapati (President of India) to help the company overcome local resistance and acquire land at its proposed site! Not only is this indecent and shameful but constitutes undesirable interference in our internal affairs and with our laws. It also gives credence to the suspicion that Posco project is not all about steel”, says Sampad Mahapatra, a senior journalist working with NDTV as Special Correspondent. As the latest blow to the company, the green tribunal of India has expressed its concern and issued notices to various government departments and agencies asking for clarifications on how and under what circumstance the clearances were issued to POSCO Project. However, the basic question is how a foreign company can be given permission and clearances to go ahead with its works when it doesn’t possess a valid MoU or agreement with the government? Which law of the country permits the federal government to issue clearances like this? And, which law of India permits a provincial government to displace people, acquire land and go for transactions with a foreign company without a valid MoU, as the Orissa government is doing? The most pertinent question about POSCO is, should any government or the governments at the state and centre sacrifice all its laws just to honour a Foreign Direct Investment (FDI) that is believed to be the largest FDI so far? Basudev Mahapatra is a Senior Journalist based at Eastern Indian city of Bhubaneswar – the capital of Orissa Province where POSCO is pushing for its integrated steel plant project.